improved the KNewStuff3 library to retrieve, process and show the authentication informations. Compared with the last year, when I worked on PlasMate, this year I really enjoyed my gsoc, had a lot of fun and met great people. As I promised more than a week ago, today I’ll show you the progress done with the authentication framework, starting with signing a plasmoid with PlasMate, uploading that plasmoid and its signature to opendesktop.org within PlasMate, and retrieve it with the Widget Explorer “Download widget dialog”. The grid view is even more complex, because the same informations are condensed in less space, so I need to figure out how to show in a proper way also the authentication information. PlasMate needs a lot of love too, and I realized it when playing on its code again; perhaps, after this summer of code, I’ll start on rewriting its internals and clean up the code. During the past week, since the authentication library is working pretty good with the plasma widget explorer1 (although it still need to be polished and refined), I decided to get a little break with it and starting on improving PlasMate. As you should know, showing the trust level of a scripted plasmoid in the widget explorer is only one part of my whole GSoC: the goal is to provide a simple way to sign plasmoids, upload them with their signature via GHNS, retrieve them from the web (again, with GHNS), show their trust level before being downloaded, and finally display their trustlevel when browsing the plasma widget explorer. The interface is pretty simple and intuitive: to enable the plasmoid signing option, simply click on the corresponding checkbox. Then, you have to select one PGP private key from the list below, and that’s all. 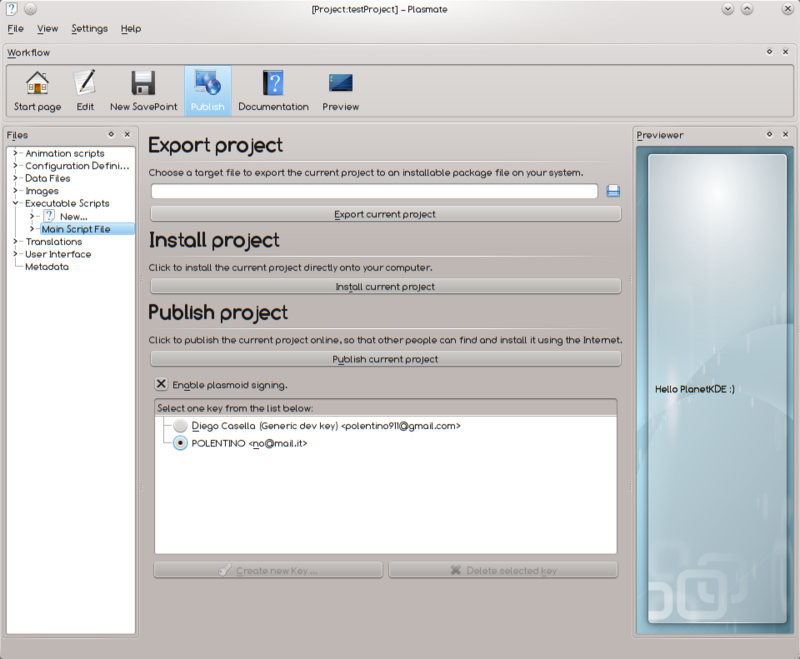 Every time the user clicks Export/Install/Publish, a new signature file will be calculated, and a dialog will popup and ask for the key password. The widget has also two buttons used to create or delete the keys used for signing; however they’re disabled for now because the creation of a new pgp key pair is not implemented in the qca api and I have to manage it on my own(so, this time, everything is good 😛 ), but the delete button is disabled because, yet an other bug™, the removeEntry() method calls the wrong command line switches, and I’m waiting for the fix2. Stay tuned for further updates, cheers ! [Update]: since the video on youtube still look like crap ( 😦 ), I’ve re-uploaded the video on blip.tv and embedded from it. Two weeks are gone without blogging, and now it’s time to show to the Planet the progess I made during this weeks with my GSoC project. Basically, when calling the startVerify(QByteArray &detachedSig) function, it randomly hangs, causing the library to freeze ( and thus the application too). After struggling a lot on the possible reasons, I noticed that the gpg process spawned by qca sometimes didn’t end, causing the issue. I wrote in the QCA mailing list, where I sent some feedbacks about what’s happened, but the problem doesn’t seems to be easily fixable. So, in the meantime, I wrote an other workaround to launch gpg with a KProcess and parse its output, until the patch is released. During week #5 I started to deeply integrate the authentication library into the widget explorer. When I made this screenshot, I basically setted a fixed TrustLevel for each scirpted plasmoid, as well for the rating icons, to test how these new informations will look once merged with the usual UI. Now, instead, the ratings are retrieved by verifying each plasmoid against its signature, if any, and the informations about the signer are showed in the tooltip. Moreover, compared to the screenshot I linked above, the icons which represents the rating and running plasmoid are now better placed in the layout, in order to save space on the bottom of the Plasma widget explorer. Urghh, seems like Youtube is taking a lot to process my video…If tomorrow the condition is the same, I’ll re-upload on blip.tv . The fourth week of Summer of Code started today: it’s time, as usual, to talk about the progress I made during the last week. The authentication library itself is not much complicate: it keeps track, loads and monitors for changes on the keys saved in the user PGP keyring, plus it adds the public keys shipped with KDE. It performs a subdivision of the keys according with their trust level and provides a method – signedByKey()- to easily test if the plasmoid and signature file passed as parameter to the function, has been signed with the key provided. In the public API, all the keys are referenced by their unique string ID, without showing the presence of the QCA framework under the hood. However, I’m not really satisfied of this implementation: look at the amount of space wasted between the plasmoids names and the bottom of the widget due to a single scripted plasmoid. That’s why I’m considering to paint the rating starting from the bottom left corner of the plasmoid icon, and move the dialog-ok icon (used to advise that the current plasmoid is running) on the upper right corner in order to save space. This week I improved the authentication library I began writing the previous week: more precisely, I’ve implemented the method responsible to verify the signature against the ID of the key passed as parameter, moved the key IDs from five QStringList objetcs to a single QMap< TrustLevel, QList< QCA::SecureArray > > object which reduces a little the lines of code and, more important, increases its storage security. Is this method that essential for my library? Absolutely. Since I have to split the keys by their level of trust, first I save the KDE IDs, then I have to iterate all the PGPKeys remaining, and look if they are signed by a KDE key: these keys will build the second level of trust. Then, the library will load the user’s private key, and whose keys will create the user trusted keys; since we want to provide a certain degree of freedom on trustlevel, the user can also sign the keys he personally trusts, so here it is an other relationships check on the keys not processed yet. As you can see, I need to know which keys signed an other, so I spent some time on exploring the sourcecode of the GnuPG plugin to find out what went wrong, and I discovered that first, the API doesn’t expose that kind of call, and second, that the plugin doesn’t call the gpg command switches –list-signs or –check-signs at all! So I wrote to the QCA mantainer about my problem, and now we’re discussing about the implementation details on their mailinglist. My only hope is that they won’t take that much to implement this feature, I’ve got my first deadline in about one month, afterall! Well, this is a brief summary of what I did on this second week of GSoC, stay tuned !